I love the texture, and it was as described with the ties inside. It’s a pretty gray. I am going to replace the buttons tho, to something more formal and less casual and contrasting. Only thing I really didn’t like is that the gray strip that the buttons are attached to are a slightly different gray. Not a huge deal. Just me being a perfectionist! Give your bedroom a simple and clean allure with the Madison Park Rianon 3 Piece Cotton Waffle Weave Duvet Cover Set. The 100-percent cotton duvet cover and shams feature a waffle weave that provides a soft textured look and feel. The button closures allow you to place a comforter insert within the duvet cover and the internal corner ties prevent it from shifting. Decorative wood button details also adorn the face of the duvet cover and shams for a charming and functional accent. 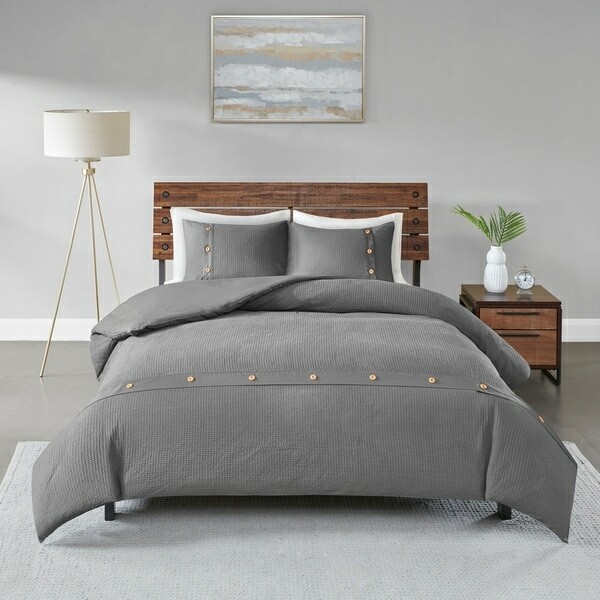 With a fresh contemporary style, this grey duvet cover set is machine washable and pairs perfectly with any bedroom decor. I loved the fabric. It does not wrinkle and stays in place while on the bed. Didn’t come close to fitting bed and cheaply made. Charge to send back by UPS almost $. Said it would be 45 days to get it back to warehouse? Wanted to give us to give us credit and not return money. I won’t buy a another thing from these fans folks.